As the New York Yankees find themselves in a playoff race, they have been bitten by the injury bug yet again. 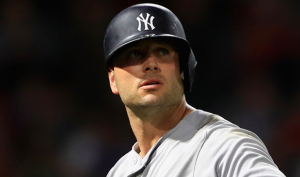 For the second time in six weeks, the Yankees have place DH Matt Holliday on the 10-day DL. In late June, the Yankees lost Holliday’s services because of a viral infection. This time around, it’s a lower back strain that will keep the team’s DH out of the lineup for the foreseeable future. Holliday played Friday night but missed Saturday’s game against the Indians because of the lower back issues. After the game, the Yankees were mulling over whether he would require another stint on the DL. Sunday morning, the team decided to go ahead and put Holliday on the injured list. The Yankees have called up first baseman Garrett Cooper to take Holliday’s spot on the active roster. During the first half of the season, Holliday was one of New York’s most impactful hitters. Before going on the DL in late June, Holliday was hitting .262 with an OPS of .877. But since his return following the all-star break, he’s hitting just .136. Holliday has one home run in that span after hitting 15 long balls the first three months of the season. The Yankees believe that the back issues have prevented Holliday from getting going offensively after returning from his viral infection. Girardi believes that if he’s healthy, Holliday can be the player down the stretch for the Yankees that he was early in the season. Until Holliday returns, the Yankees will have a few different options at the DH spot. Catcher Gary Sanchez may be the top candidate. Sanchez has struggled defensively this season, with Austin Romine being a better option to handle catching duties. However, the Yankees can’t afford to lose Sanchez offensively, especially with Holliday on the shelf. Making Sanchez the primary DH could be the ideal solution to Holliday’s absence. The Yankees are also trying to juggle four outfielders in three spots, giving them the option of putting one of them in the DH spot to get all four in the lineup at the same time. Of course, Jacoby Ellsbury has had all kinds of troubles at the plate since returning from a concussion in late June. The team may not want to try too hard to get him in the lineup right now. Of course, the Yankees would prefer to have the Holliday of the first half of the season occupying the DH spot on a daily basis. But right now, there’s no telling how long Holliday will be on the DL or if he’ll be able to regain the form he had earlier this year. If Holliday returns for the stretch run, he could prove to be an important x-factor for the Yankees. But being without Holliday for the time being will certainly hinder New York’s playoff push, as the Yankees look to challenge the Boston Red Sox for the AL East crown.